"Wedding dress shopping preparation saves you money and stress!" 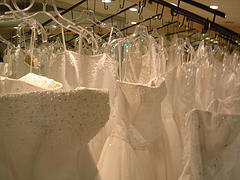 Are you ready to go wedding dress shopping? How soon should you start to shop for your dress? Wedding planners suggest between nine to twelve months prior to the wedding as being the ideal time frame to start. This nine to twelve month time frame allows you plenty of time to complete the process without being stressed out. Explain? 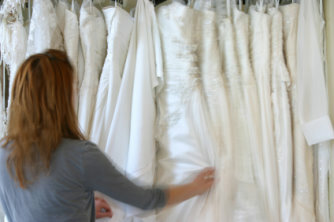 Each wedding dress designer and/or manufacturer has their own delivery dates. These delivery time frames range from 2  6 months on average. So if you choose a dress, say with a 6 month delivery time frame, you will need to order it at least 7  8 months in advance of your wedding date. 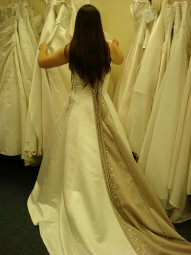 This way it will get to you in time to allow at least 1 month for your alterations to be done. If you are going to have a bridal portrait made before the wedding you need to factor in this time. Your photographer may need any where from 1 week to 2 months prior to your wedding to process and deliver your portrait. Because things can go wrong with the order, like wrong size ordered, lost gowns, damaged gowns, wrong color and wrong dates written on order . . . you need to give yourself plenty of time. should consider these first steps . . .
Also look at pictures of wedding dresses online and in bridal magazines. "Your perfect bridal dress should be a style that will flatter your figure." It will also compliment your coloring, personality and wedding style. Learn as much as you can by researching the pages of this website on how to pick a dress to fit your wedding theme and that compliments your figure. Start to collect wedding dress pictures and sketches of styles that you think would be perfect for you. Before you take these pictures of wedding dresses to the bridal shop, you might want to organize them. How? Learn how to turn wedding dress pictures into a collage or sketch, by going to the pages about how to design your own wedding gown. Ask friends and family who are married to give you a referral before going wedding dress shopping. They will be able to tell you which shops give great customer service. Also, check with the Better Business Bureau to see if any of the bridal stores you plan to visit have any unresolved complaints. "To ask the minister performing the ceremony if there are any modesty restrictions." What usually happens is that the bride doesnt find out until after she has purchased her dress that there were restrictions. How did I come to know about this problem? "I have had to help brides in this situation modify their wedding dress for modesty purposes." "Dont let this happen to you." Find out if there are restrictions before you begin your search. This information will determine the style of dress you will have to consider. for wedding dress shopping . . . If you happen to be a bride who has less than six months to plan a wedding... all is not lost. But you have to be "very pro active" in the search for your gown. You must make it a priority. The closer it gets to your wedding date, more than likely you will have to settle for something that may not be the dream dress you wanted. Remember . . . it takes 2 to 6 months for the delivery of most bridal dresses. This is the case whether you order your wedding dress online or purchase from a bridal shop. So you have to now look at only designers with short delivery dates. Find out who these designers are and only look at their wedding dress designs. There are some bridal designers who have "quick delivery gowns"in their collections. But the selection is limited. And you are still talking 4 to 8 weeks. Some designers offer rush deliveries. But these rush charges can be pricey. Even with a rush on your dress . . . think of the stress you will experience wondering if your dress will come too late for the alterations that may be need.